HASTAC's second annual international conference, with a theme of "techno-travels," sought to examine the multiple ways in which place, movement, borders, and identities are being renegotiated and remapped by new locative technologies. Featured projects delved into mobility as a modality of knowledge and staked out new spaces for humanistic inquiry. Participants explored such questions as: how are border-crossings being experienced and narrated amidst mobile technologies? How are digital spaces interfacing with physical ones, and how do we move between them? And what has become of stasis and geographical identity in a world saturated by techno-travels? The conference literalized and metaphorized travel, as over one hundred attendees participated in sessions at Irvine, Los Angeles, San Diego, and on the connecting corridors of Southern California. 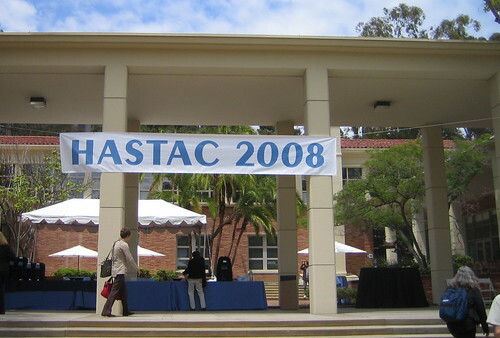 For all blog posts about HASTAC II on the HASTAC site, go here. Photos thanks to Brett Walters, Anne Helmond (also see: her website), and Cathy Davidson, courtesy of Flickr™.